The Detroit Red Wings need to find a way to get back to winning and creating more offense up front, and one of the solutions is to make a significant change to their lineup tonight as they face the Winnipeg Jets. 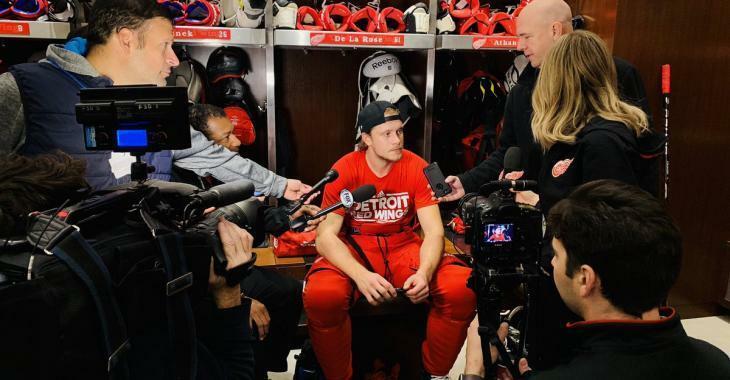 Jacob de La Rose was unsure of his NHL future when the Montreal Canadiens waived him last week, however, after he was claimed by Detroit, he is ready to make his Red Wings debut tonight and to be a difference maker for the team that currently sits last in the Atlantic division with just four points. The former 2013 second-round pick has yet to play this season, after having a cardiac issue during the preseason, but he has been cleared to play and has now solved all Visa issues in order to take part in the contest against Winnipeg tonight. He feels ready to have an impact on his new team. "I think I'm a responsible two-way center," de la Rose said to reporters following practice, according to team insider Ansar Khan of MLive.com. "I can play on the wing, too. Good skater, good on the penalty kill. I think I have some offense in me that I hope I can bring to this club, too. "Hopefully, I can come in with some new energy and try to bring my game and help the team." De la Rose has taking part in 119 games over four seasons with Montreal, recording eight goals, 11 assists and 51 penalty minutes and positing a minus-16 rating. He is expected to bring depth at center and support the team on the defense and also on the penalty-kill. Michael Rasmussen will be healthy scratch Friday, with Martin Frk rejoining the lineup. Let's see how he does tonight.